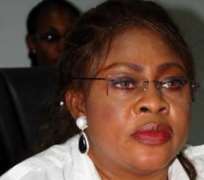 Hundreds of Igbo Youths in Enugu, under the aegis of Igbo Progressives Union, on Saturday protested against calls for the sacking of the Aviation Minister, Stella Oduah. Also, Oduah's kinsmen, led by High Chief George Nwabueze, stood in defence of their daughter, exonerating her from any wrongdoing in the purchase of the cars. The protesting young men and women, who carried placards with different inscriptions, accused an unnamed 'cabal' of being behind the calls for the removal of the minister. The youths insisted that the intention of the cabal was to stop the minister from going ahead with her transformation agenda in the aviation sector. The group, who spoke through their leader, Emeka Agbo, said Igbo youths were prepared to go the whole hog to ensure that their daughter was protected. Agbo, who is a student at the Institute of Management and Technology, Enugu said some highly-placed individuals were determined to rubbish the towering pedigree and achievements of the minister. He said, 'This is a woman that has given the aviation sector a new face since she came into office. Today, our airports can compete with airports in foreign countries. On their part, the people of Ogbaru, led by Nwabueze, said the battle was not about the minister but the 2015 presidential elections. Nwabueze said some people who are not comfortable with the transformation agenda of the president had ganged up to tarnish the image of members of the federal cabinet. 'They also want to rubbish the President ahead of the next election,' he said. Nwabueze said the criticisms against the minister of aviation were not based on genuine grounds, but were politically motivated.